FREE Craftsman 13 Inch Tool Box With Tray! You are here: Home / Great Deals / Christmas Deals / FREE Craftsman 13 Inch Tool Box With Tray! 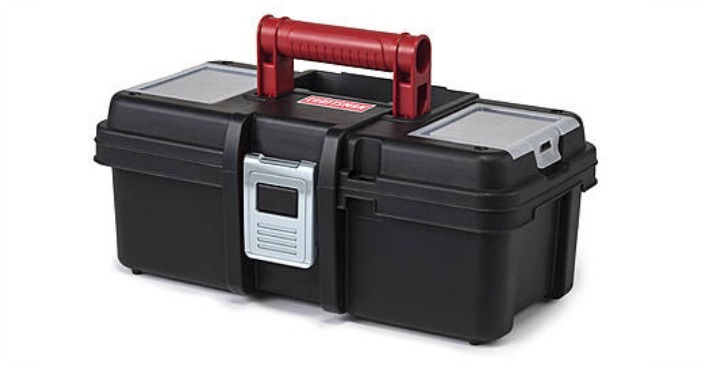 Sears has this Craftsman 13 Inch Tool Box With Tray on sale for $4.99 (Reg. $10) and you can get back $5.04 in Shop Your Way points, making it FREE! Get ready to work with the Craftsman® 13-Inch Classic Tool Box. Ideal for either a professional or an amateur craftsman, this heavy-duty plastic tool box offers sufficient storage for the tools that you use the most and plenty of organizational features so that you’ll never have to waste time scrounging around the bottom of your box for the item that you need. Two integrated lid organizers make keeping screws, nails, wall anchors, wire nuts and other small pieces neatly contained and close at hand a cinch.